Some exciting things are happening in my new neighborhood, so I thought I would share! 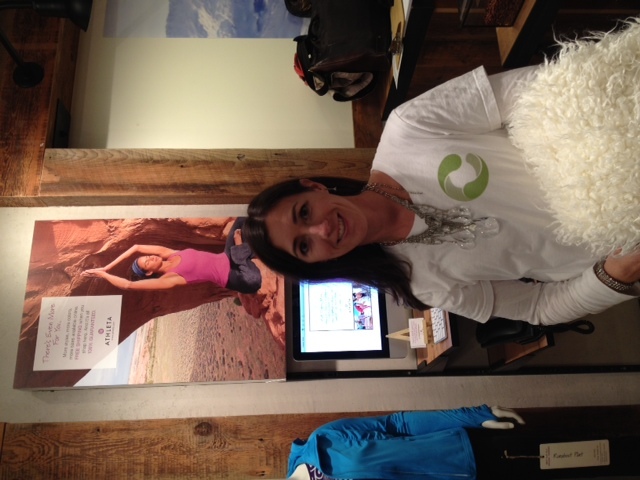 Last night was the Opening Party for Athleta DC in Georgetown. 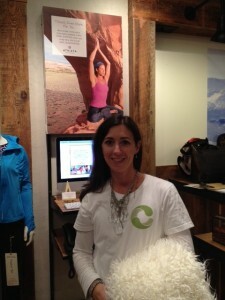 http://athleta.gap.com/ Athleta sells fabulous women’s active wear, workout clothing and accessories. The products have only been available via catalog until November 2nd, when they opened the first store in L.A. The second store opened in Philadelphia on Nov.9th and then last night was the Private Shopping Event in Georgetown. (Thanks to Gina from Athleta DC who sent me an invite!) The store is beautiful and right in the middle of everything on M Street. The event was packed, with ladies changing in the aisles to try stuff on instead of standing in line for the waiting room! Tuxedo clad servers carried drinks and appetizers and credit cards were being pulled out left and right – these ladies were there to SHOP! I decided to shop from my computer at home later, but really went there to soak up the vibe and meet Gina. She has done a fantastic job of getting the store opened and getting the word out to everyone involved in health and fitness in the DC area. I plan to get involved at the M Street location teaching some workshops, so I will keep everyone posted! I am also really excited to announce that Prana Physical Therapy is co-sponsoring a workshop at Gold’s Gym, Alexandria on December 3-4. My friend Mike Fitch of Global Bodyweight Training is bringing his Animal Flow Workout to the D.C. area. http://www.globalbodyweighttraining.com/animalflow-workshop/ This workshop is geared toward health and fitness professionals as well as advanced bodyweight training enthusiasts. The workshop is the first step in getting certified to teach Animal Flow classes. Mike developed this system of exercises and has been teaching classes at his gym in Miami. 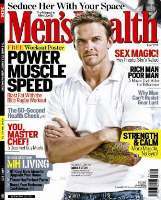 The workout was recently released on DVD and he just started taking the show on the road. I am thrilled that he decided to come to the D.C. area and hope you will join us if you are looking to take your workouts to a new level. And if all of that wasn’t enough, our friends Megan and Sara from Mind the Mat were featured on the Fox DC Morning Show this week! http://bit.ly/tIZRcV These ladies run a beautiful Pilates and Yoga studio right here in Del Ray, where their combined talents bring healing and wellness together from their physical therapy, massage, Pilates and Yoga backgrounds.